I’m just finishing up a 6 month work placement in Switzerland where I took my bike over and used it as my main form of transport. 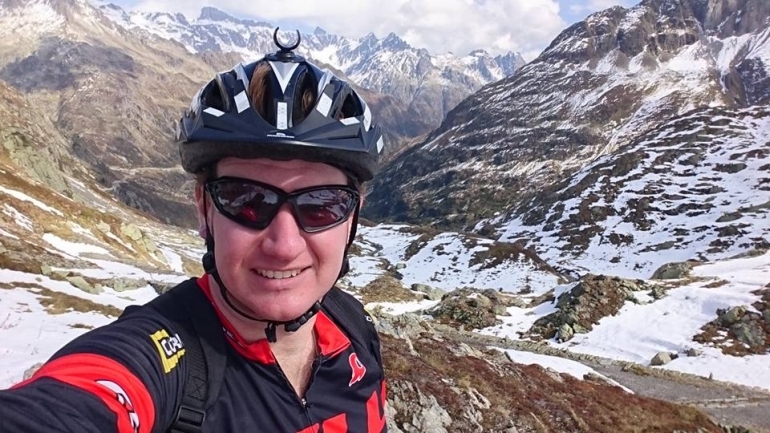 I had a great time in the mountains each weekend but wanted to outline some of my experiences with regular riding as it may be worth some thought with regards to advocacy work in Sydney/NSW. The Road design and infrastructure section may be worth a read for those of you involved in advocacy and I think that traffic light sequences may be an area that can be pushed more in Sydney because of the flow on effects. For those of you who aren’t interested in this then feel free to stop reading now. Location: Mainly Bern but also short times in Zurich and Geneva where I would say that the experiences below would be similar. Rail transport in Switzerland is very good but also expensive. Tram and bus transport also exists in the cities but is not extremely frequent (like Sydney). While most families will have a car, its generally only used for travelling large distances. Parking spots for cars are almost non existent. Almost everyone will have a bicycle of some sort which is used for short trips to shops etc. Many people will leave a cheap single speed “locked up” in each major town so that they can use it after catching the train in. There are large areas where you can leave your bike for free and the biggest one would hold at least 1000 bikes. Next year Switzerland will roll out a bike share program so this may change. Kids ride to school and activities themselves although parents tend to accompany them (also on bikes) if they are primary school age. Parents with very young kids use ebikes with a child trailer connected to it. Grocery shopping is done on bikes with panniers. Occasionally you see cargo bikes but not very often. The classic Sydney sight of mum with kids in a large 4WD just doesn’t happen here. Switzerland does have a lot of dedicated (separated) cycling paths but these are in tourist areas in the countryside and are not used for commuting. In the cities, most roads will have a painted line on the side of it for bikes. At each intersection there is also a “bike box” (just a bike sign printed on the road between the car stop line and the pedestrian walk line where cyclist filter to. There is almost no separated infrastructure and certainly much less than Sydney. The big difference in Switzerland is the traffic light sequence timing. The traffic light sequence timing is heavily biased to pedestrians. In Sydney the sequence timing seems to be pedestrian green for 5sec, then 10sec of flashing, then cars get green for next 2-3 minutes. Its almost the opposite in Switzerland. Before cars get a green light to go forward, the pedestrians get a green for 5 seconds and this remains green even when the cars get green. Cars just have to wait until all pedestrians have finished. Its not uncommon for only 1-2 cars to get through an intersection in a light sequence. The red sequence is also biased towards pedestrians as well, where the car light will go red a few seconds before the pedestrians crossing in the same direction will go red. Bike specific traffic lights are uncommon but the resulting outcome is very favourable for cyclists because cars are always stopped for long periods at intersections so its very easy and safe to filter to the front of the intersection and getting through without delays on the next light sequence. This is what is making the super ebikes very popular because they can also filter to the bike box and be able to hold good speed on hills without sweating. I’ve now started to form the opinion that changing the traffic light sequences in Sydney to favour pedestrians is actually a more effective way of making cycling safer because it costs very little money compared to dedicated infrastructure and you’re not publicly promoting “cycling” which gets certain people upset. This was another big difference to what I’ve seen in Sydney. Swiss are well known for “enforcing rules” and this also applies to bikes but from my experience, they are very good at appropriately using discretion. I was warned by work colleagues not to ride through red lights because police would fine me but after observing cyclists regularly doing Idaho stops (essentially cyclist can treat red light as a stop sign and stop sign as a give way sign – which are technically illegal in Switzerland), this is never enforced and is implicitly encouraged to improve traffic flow for cars. If you fly through an intersection on red without looking then the police will definitely chase you down though. The Idaho stop situation creates the hilarious scenario where car drivers with you at the intersection actually want you to pass through the intersection on red because they realize it will help them to go when they finally get a green light. There is no minimum passing distance rule in Switzerland but I have always felt much safer than riding in Sydney traffic. Drivers are very skilled and patient when driving around bicycles. When overtaking, they will slow to the speed of the bicycle, wait for a safe straight location to overtake and then gradually increase speed to pass the cyclist. There is never any revving and the overtake speed is never significantly faster than you are riding. Sometimes they will pass with <1m but the speed is always quite slow so you never feel the rush of air. The Sydney “technique” of swerving right into oncoming traffic and then swerving back in front of the cyclist without releasing the accelerator pedal just never happens here. Helmets are not compulsory in Switzerland (except on the super ebikes) and their usage depends highly on what the rider is doing. When I catch the train into the alps on the weekends there are lots of MTBs on the train and they all have helmets. All the road riders do as well although a common technique I saw among older male riders in the middle of summer was to not wear a helmet on a climb (climbs take several hours in Switzerland – imagine doing Galston gorge 10 times breathing through a snorkel without stopping), and then put it on with windproof jacket etc for descending. Helmet usage for commuting was about 30-40%. I think it increases when it is raining but this could be because the people who don’t normally wear helmets also don’t ride in the rain either as there are always less cyclists when the weather is bad. Helmet use for going to shops etc. was <10%. At the supermarket there are 2 car parking spots and >50 bicycle parking spots. I rarely ever saw a helmet. Many Swiss people will say that its stupid and dangerous to ride without a helmet, but when you press them on it (such as when I saw a colleague without a helmet riding to the pub), they don’t think of utility riding as “cycling” and are only referring to helmet use in “sport riding”. Helmet usage is encouraged though. Bikes sold in shops will always come with a helmet free and helmets (with specially cleaned padding) are always provided free with hire bikes and ebikes. FWIW I used my helmet when “proper” riding on weekends and also commuting but not for going to shops/restaurants etc. I commuted each day by bike (6km and 100m climbing each way). It was about 5-15min quicker than public transport depending on the connections. Of the ~1000 that worked in the office with me, ~800 would commute by train, 150 by bike and tiny amount by car (there was almost no parking available which is normal). 1. The most common commuting bike is aluminium frame “old school style” MTB with front suspension, 3×9 Shimano XT drive train and 35-38mm semi-slick tyres. Dynamo hubs are much more common than Australia too. 2. The next most common would be e-bikes (both regular and “super” ebikes. 3. There are also some old steel road bikes being used with 2×9 ultegra drive trains as well. The Swiss are all very wealthy and on the weekends the “nice bikes” come out. All the road bikes riding in the alps will be carbon fibre with dura ace groupsets. I have rarely seen anything lower than Ultegra di2 while on weekend rides and have never seen anything lower than 10 speed ultegra mechanical. MTBs are at similar levels with XTR and SRAM eagle drive trains very common. There are 2 types in Switzerland. The regular one which is like what you can get in Australia with a 250W pedal assist motor that cuts out at 25km/hr. The other type is a “super ebike” with a similar construction but where the motor doesn’t cut out until 45km/hr which makes them illegal in Australia. These require a license and number plate which you can get when you’re 16 and are quickly growing in popularity. A car license automatically qualifies you to ride it as well. While I haven’t personally used one, people I met love them as they allow you go ride easily as fast as cars in suburban/urban environments without the parking hassles. They weigh around 20-25kg including battery. I rode a regular ebike when my parents visited on a ride that was 60km and >1000m climbing so equivalent to a 3 gorges loop with steeper hills. My parents are beginner cyclists in mid 60s and would be capable of an easy-medium BN ride. We all had no issues getting through the ride and the battery was still 70-80% full at the end. The main advantage of it is that you accelerate up to cruising speed very quickly (so no effort at traffic lights) and hills just become like flat roads. I would seriously consider buying one in Australia for commuting when you don’t really feel up to hills. If you have any questions then please reply or I hope to be running some BN rides once I get back to Sydney.